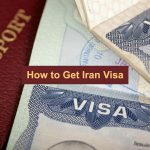 The northern provinces of Iran are located along the Caspian Sea. Provinces that live in the shadow of rainforests and foothills. An unrivaled nature covers it beautifully but its history always shines through. 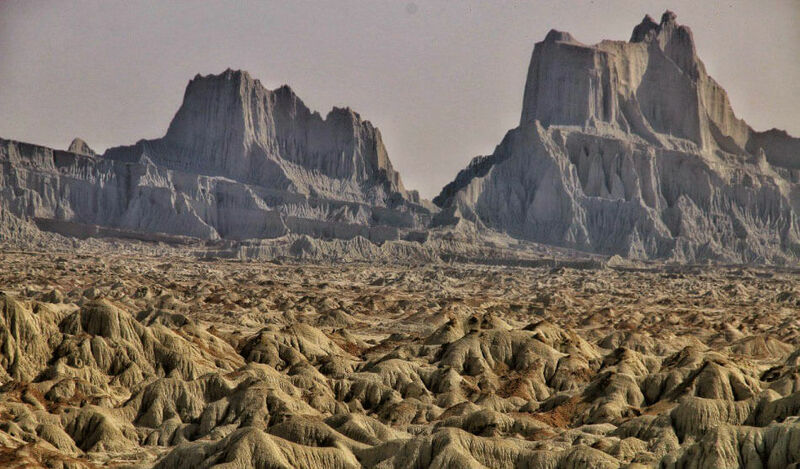 We want to go to one of these provinces, which, with his name, cries of liberation and freedom from Mirza Kuchak Khan Jangali, resonates in our minds and hearts. 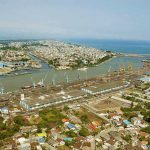 The local colorful clothes of the people will be a spectacular sight to see plus the smell of grilled fish which is a trademark for this particular region. 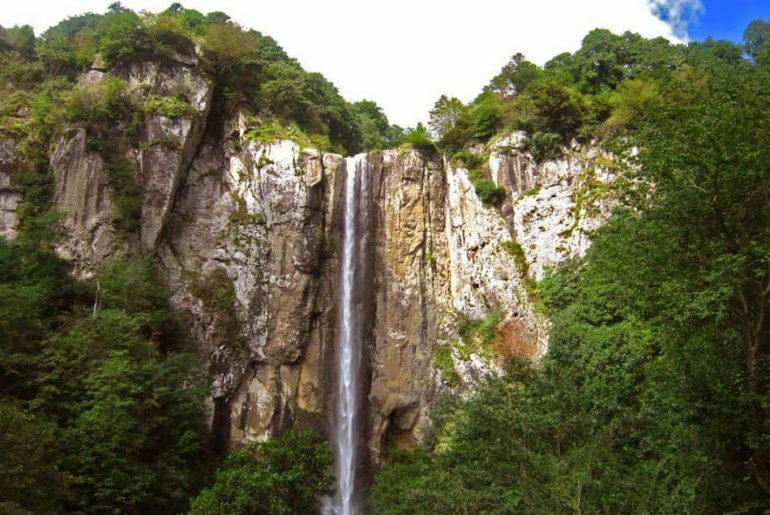 Today, Gilan is our destination, a place that has a strange combination of history and nature and culture. A region that looks like a rainbow with seven-color sights. If you feel down a bit you can go to the forests or get to the sky at its heights and peaks. The desire to hear the music of the sea waves will take you to the coast of the Caspian Sea. 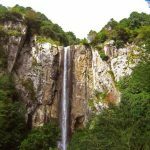 If you have the cravings of walking in the streets of the village or at the heart of history, you can simply go to Gilan and enjoy it. This time, we will introduce the province and will head to every corner of it in the future and we will depict all the spectacular scenery later on. 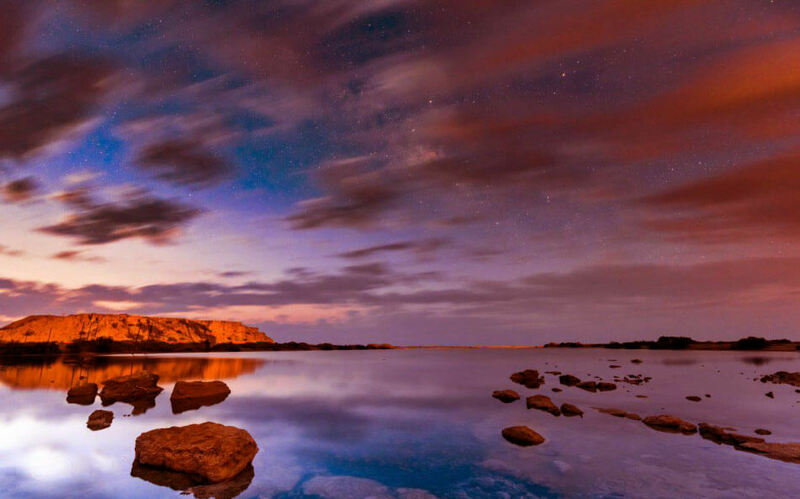 Perhaps you’ve seen pictures of colored lakes around the world, but do you know that the Chabahar lagoon is one of them? 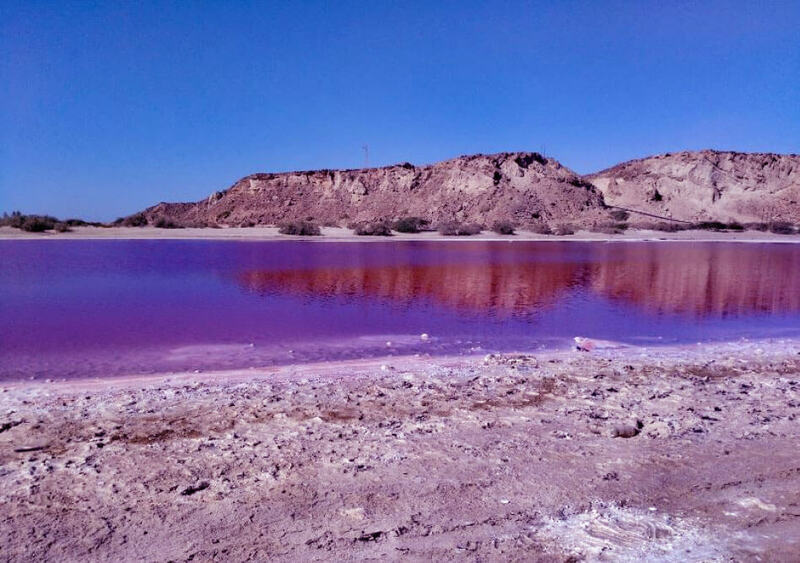 Pink lake , also known as Chabahar Pink Lake, is one of Chabahar’s spectacular attractions in southern Iran. 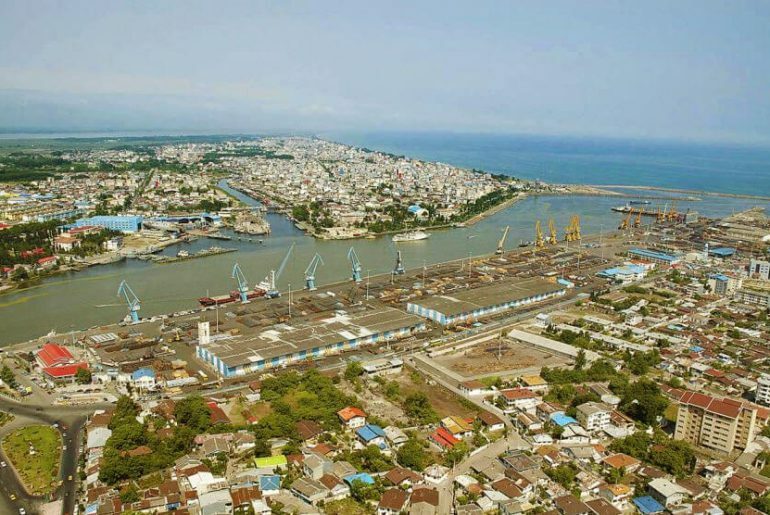 If you want to know where the lagoon is and how you can reach it, or how it came about and why it’s colorful, continue to stay in touch with us to get to know more. A unique lake in Iran and the world. A pink lake is not something you can see everywhere and only a few countries have it. Chabahar pink lake is a good destination for bird watching. The marbled duck which is in danger of extinction is also located on site. You can see many beauties as you go from Chabahar to Gwadar bay. It does not take long to reach Ramin village, and after that pink waters attract your attention. 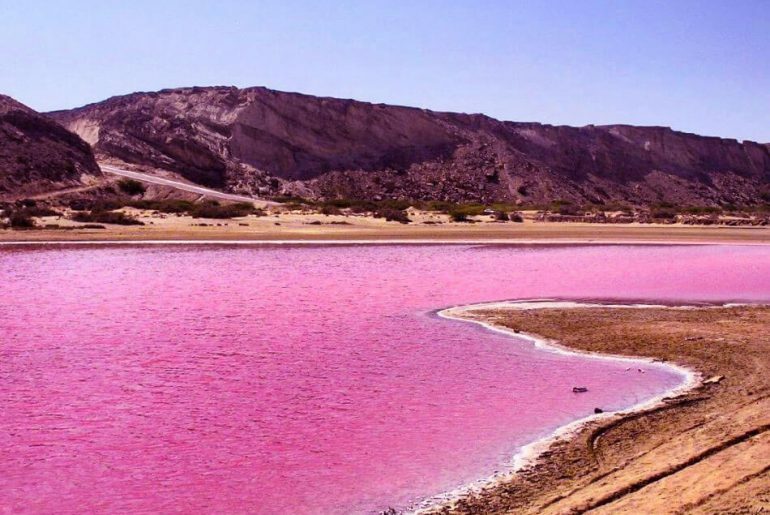 This is the lagoon in question, located in a village of the same name and known as the pink lake of Chabahar. A lagoon spawned from the stagnation of water from Oman Sea between two mountains has created an interesting ecosystem. 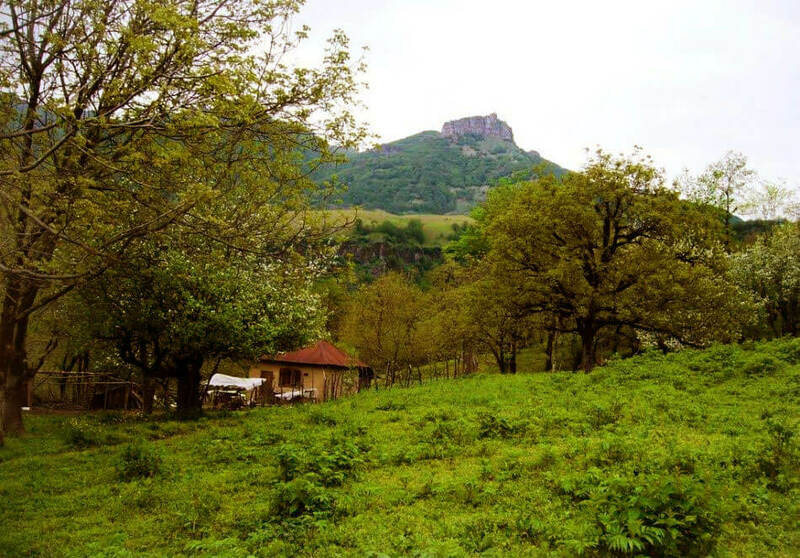 The lake is located in a rocky strait overlooking the mountain and offers an eye-catching view. You might think it’s some sort of milkshake but in fact, it is one of the world’s most salty waters with a beautiful and deceptive appearance. During winter the lake covers a distance of about 10 hectares and more than 14 kilometers of it also gets over flooded. There are not many facilities available around the lake and due to that, the site seems very neat. Occasionally, sea oysters and sea salt are sold by the locals and in other parts of the region, locals are collecting salt from the lake in real time. Despite all its simplicity, the lake is at the height of its glory and beauty. 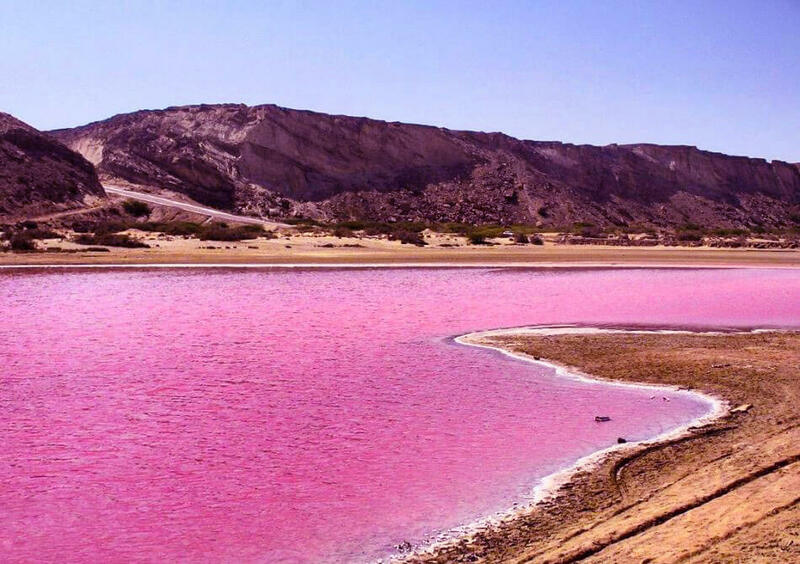 This phenomenon is limited in number around the world: Lake Hillier, Blue Lagoon, Spencer Lake in Australia, Lake Retba in Senegal and lakes located in South Africa, Vancouver and Bolivia plus this one which is in Iran. The pink water reaches the yellow coast, and in combination with the greenery of plants and the sky’s blue, it presents a picture to the viewer not seen anywhere else. 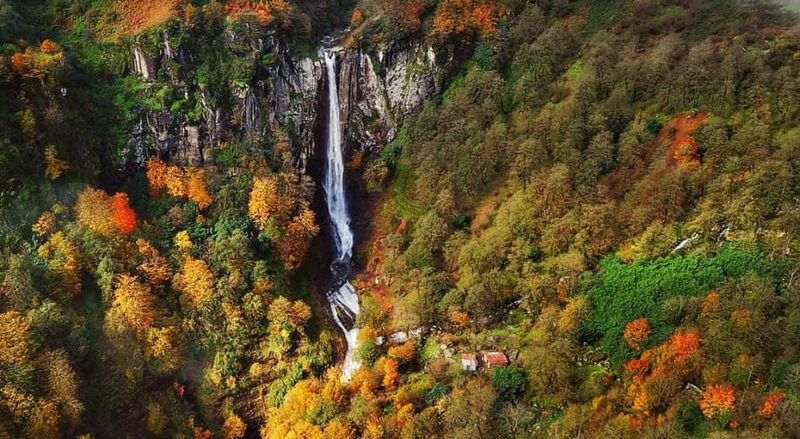 The presence of hot and cold water springs in a bed and parallel to each other in this valley is an amazing phenomenon that you will not find anywhere else. 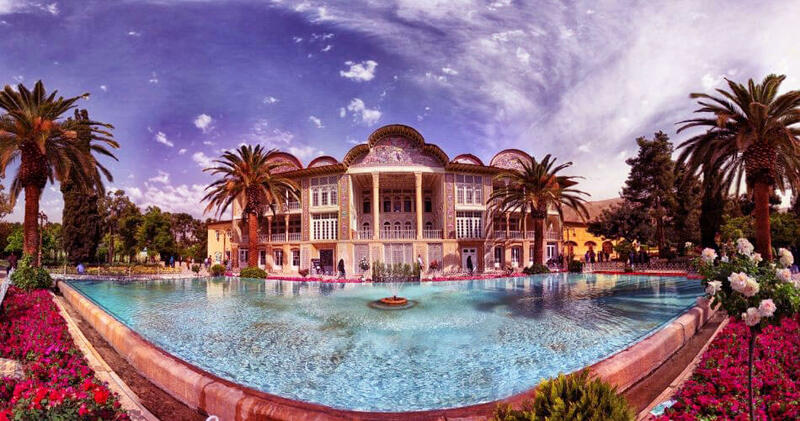 Many tourists visit Morteza Ali Springs for their healing properties. At the end of the path, there is the thinnest and tallest arcade dam in the world known as the Abbasi dam. Amongst the walls of the spring, there are very old graves belonging to the Zoroastrians who lived around here many years ago. 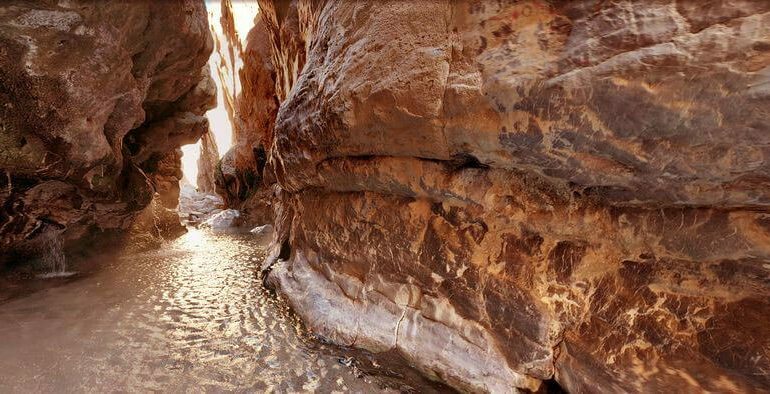 Join us in this article to explore this amazing phenomenon which is one of the most famous places in Tabas. This unique spring is known not only because of the hot and cold springs in a bed but also because of the thinnest arched barrier in the world, which is also called the Abbasian vault. Come along with us to explore the wonders of this spring. 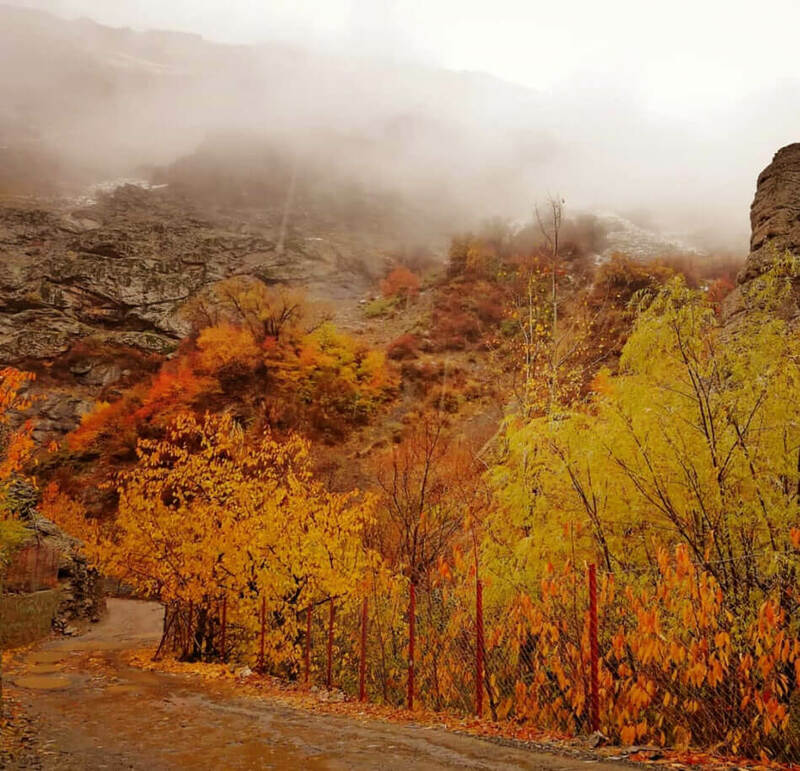 This time, we want to head to the village of Ammameh, Tehran which is one of the capital’s good towns in terms of weather for Yaylak. Ammameh has a host of fruit trees and rivers that feed the village. The architecture of the village has undergone many changes over the years, but the effects of the old houses can still be seen. 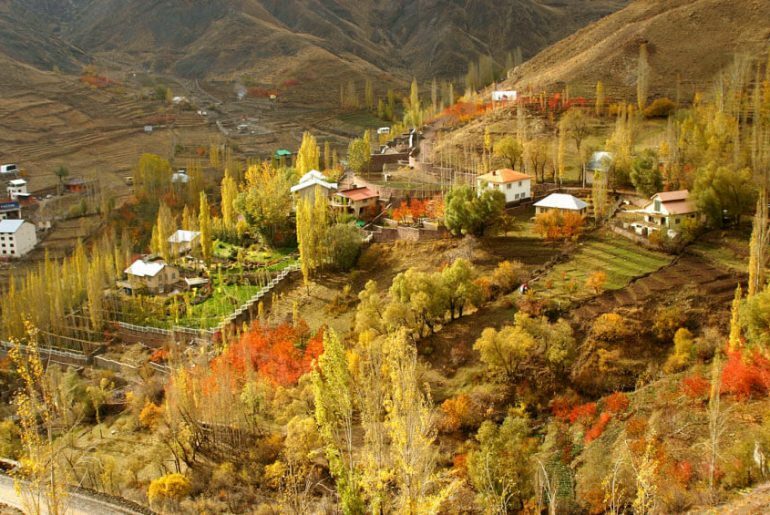 Come along with us to this village and let’s have a wonderful experience. 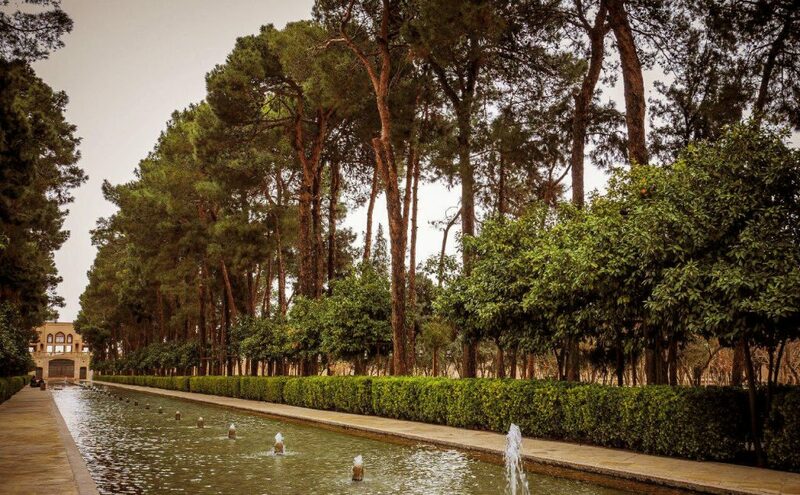 In the list of Iranian gardens that are known in the world, we have chosen to talk about Dolat-abad garden in Yazd, that entails the greenery of the trees, the sound of the water and the beautiful passage of tidal streams. This spectacular garden, which has an amazing wind turbine, has been around since the Afsharid dynasty. 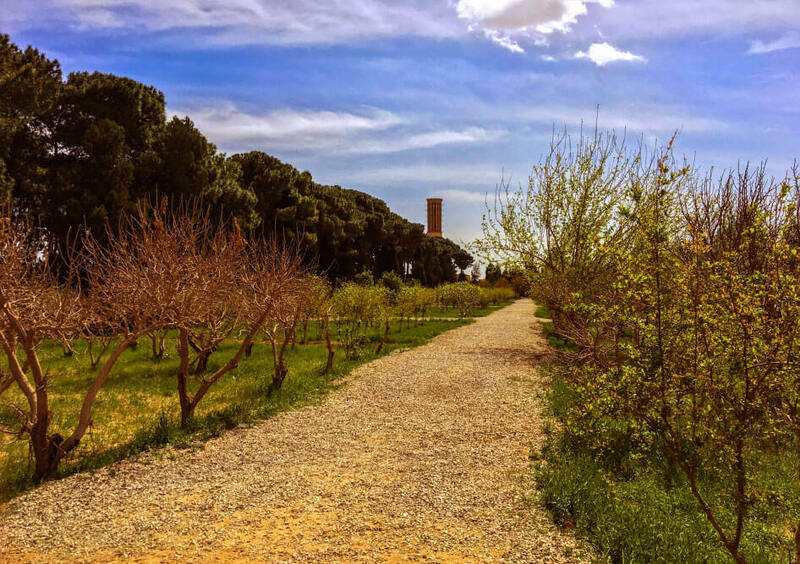 We want to tell you about the history of the Garden and take you on a historic journey. We start with the architecture; then, we examine it a few times and consider each of its parts. Follow us as we embark on this journey. 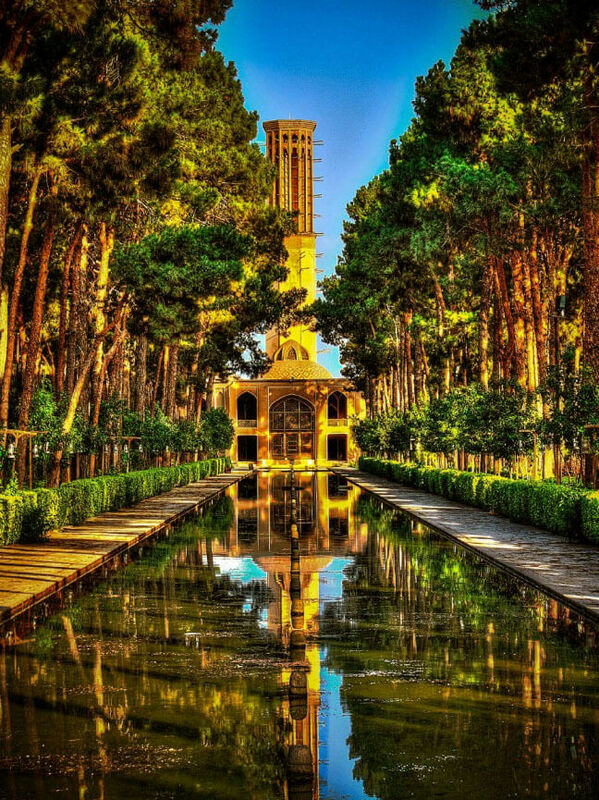 One of 9 Iranian gardens that have been named in the UNESCO World Heritage List and have international reputation. This garden has the world’s tallest windmill, and architecturally it is quite unique. In the eye-catching area of ​​the garden and the old building itself, there is a traditional café that is simply amazing. The beautiful and stunning nights in this garden are waiting for you. 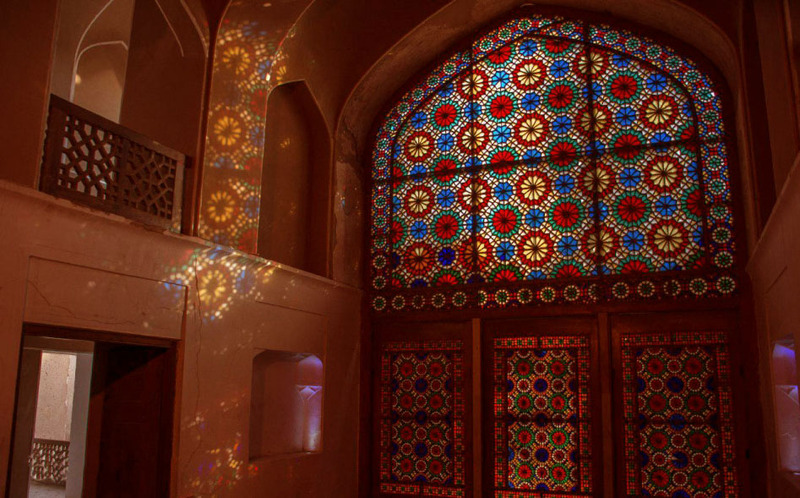 It is one of the most beautiful and historical buildings in Yazd. Inside the city of Yazd, which is embraced by the sun, there is a delightful atmosphere that diverts you from the city and its bustle. In Dolat-Abad garden Boulevard, there is a sign which shows you the entrance to the garden. 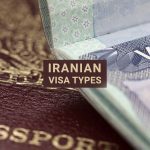 When you arrive, you must go past a beautiful vestibule that caresses your soul with traditional Iranian architecture and also a handicraft booth which is hard to miss. When you step in you can see that there is a wind tower at the end of the passage. 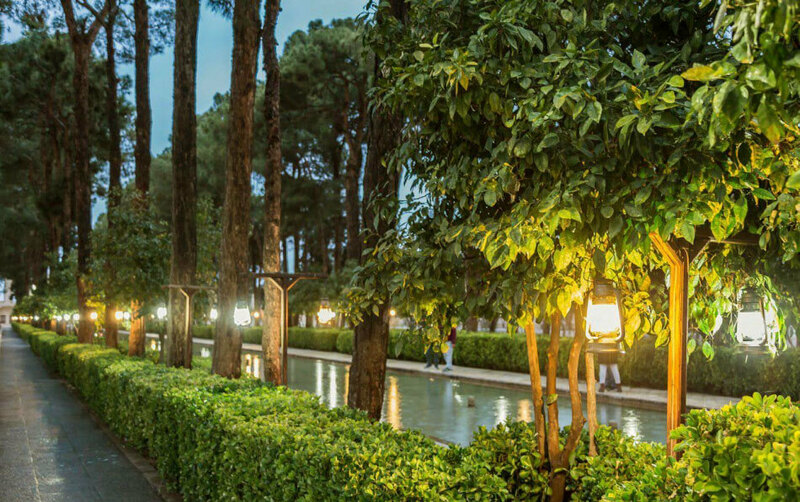 Dolat-Abad garden is one of the oldest Persian gardens which goes back to more than 260 years ago. In each corner of the 6.4-hectare area, you can see something new and fascinating. Grape, cedar and pine trees are seen everywhere, and in the spring the smell of Damask roses is in the air. 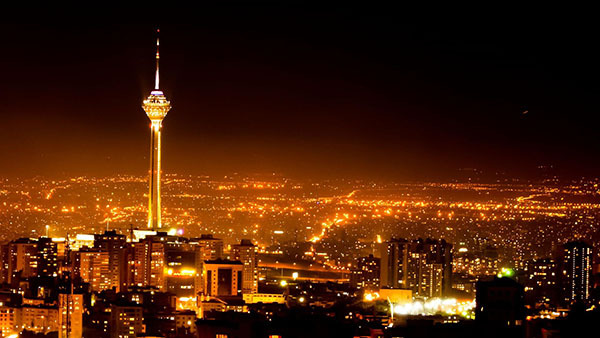 From the trees and from the waterway to the famous building of the garden, which has the tallest windmill in the world, it is indeed the best of Iranian architecture all gathered into one complex. But this is only just a superficial look at this amazing place. You need to know about this garden in order to understand how architects used their craft to create such gardens in this desert city. At the time of Afsharid dynasty, Mohammad Taqi Khan Bafqi, who was called the Grand Khan, held the title of ruler and governor of Yazd. 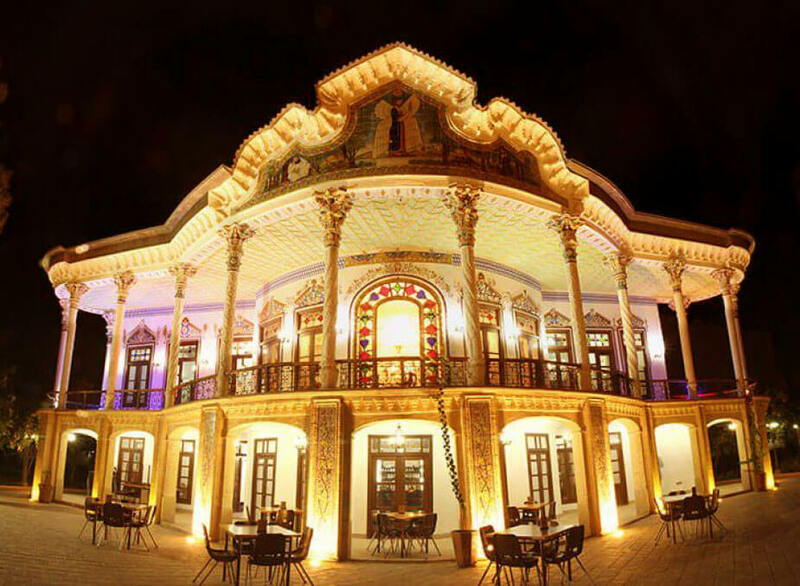 He was the leader of the Khavanin family, the father of Abdul Razakhan Yazdi (the next ruler of Yazd) and distant relative of Ahmad Sultan Ali Khan, known as Minister Afkham (Qajar minister) and Afkhm Ebrahimi and Afkhami families. In 1160 AH, he founded a garden at the end of the Afsharid period. The garden was later used as the residence of contemporary rulers such as Shahrokh Mirza and Karim Khan Zand. 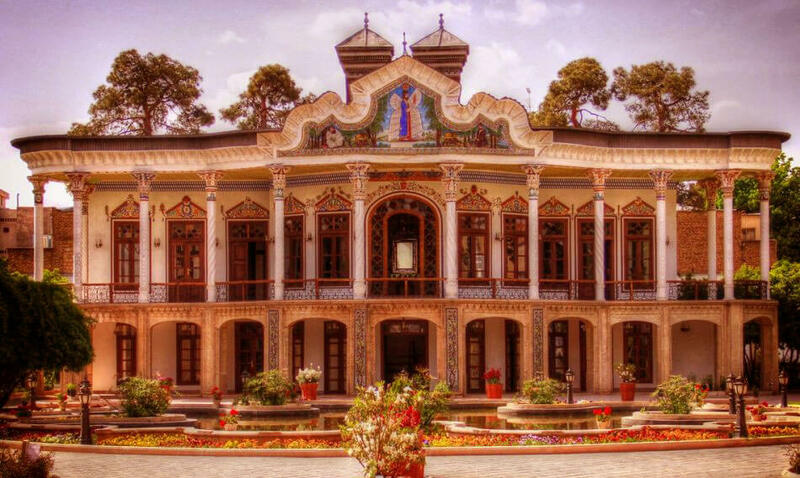 During the Zand dynasty, this building was known as an eye-catching phenomenon known as the eight Gardens of Dowlat Abad and the rest is history. 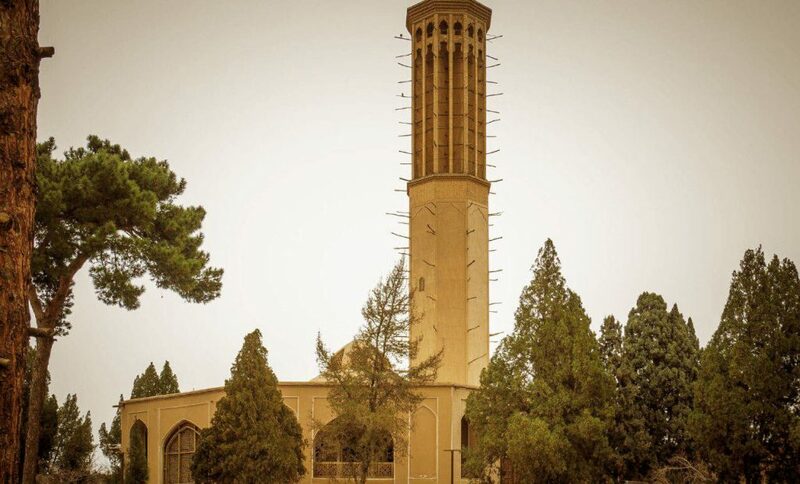 At the time of Muhammad Taqi Khan the garden was considered outside of the jurisdiction of Yazd city and at that time there was a famous street at the northern end of the garden which had a lot of trees. The number of these trees was so great that they pretty much covered the whole garden and created a sort of unique space. 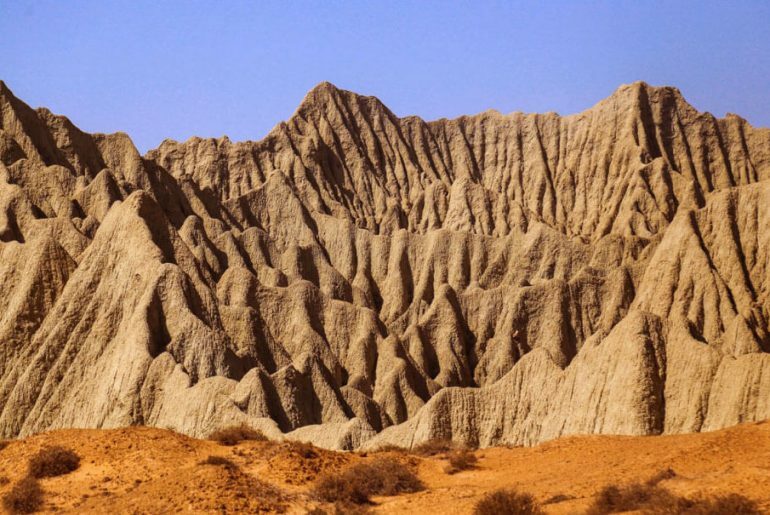 The street was known as the thousand trees, it had 4 to 5 meters in length and extended more than 20 kilometers, all the way to Rahim Abad. 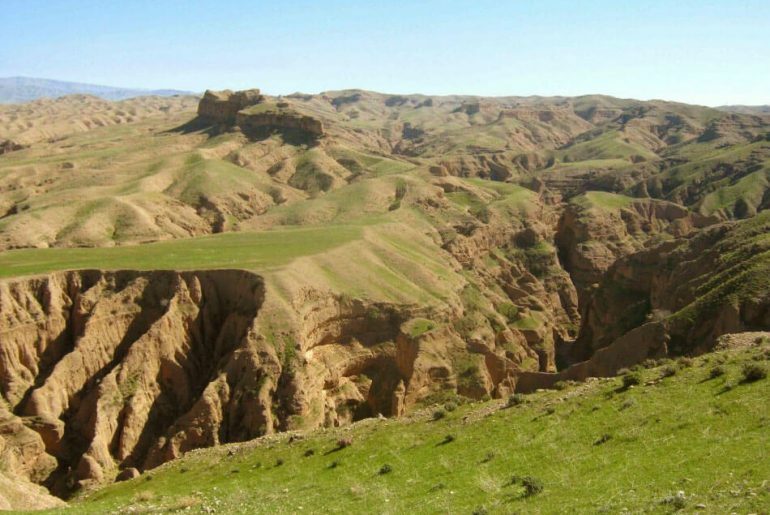 The eastern side of the garden was limited to a street 8 km long and from the west the garden reached a dried up river. With the expansion of the city during the Qajar period, this garden was connected to the Charminar (one of the gates of Yazd city) but was still outside the city limits. Over time, the city grew bigger and larger, filling the urban texture around the garden. 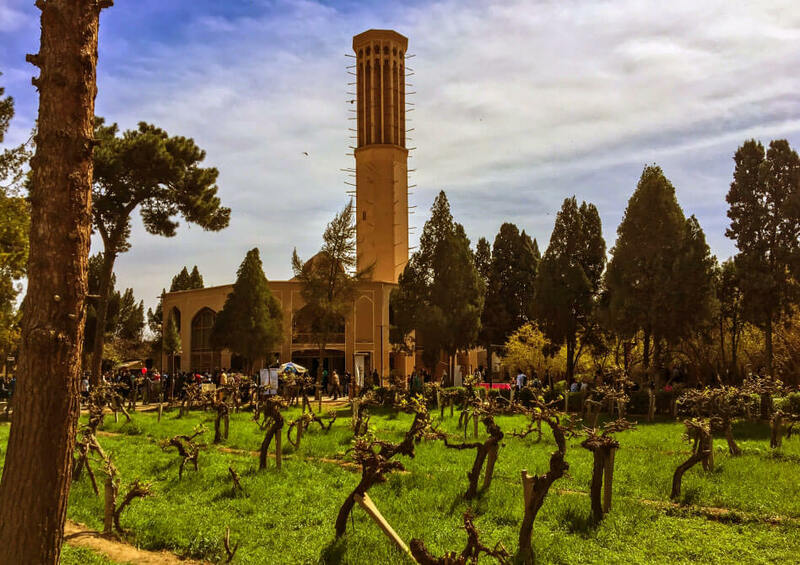 During the Pahlavi era, with the expansion of construction in the suburbs, buildings were built around the garden, and gradually the garden itself became a part of Yazd city. The deceased Mohammad Taghi Khan, at the end of his life, devoted the garden, its qanat and some of the lands that were irrigated by this aqueduct to The Fourteen Infallibles. He also gave a part of the land to his son. No one is allowed to seize the water before it passes through the gardens, even if, for example, there is not much land left. That is if it’s necessary for the water to pass through somewhere else in order for it to reach the gardens itself, then permission is to be granted by the authority in charge and may God curse anyone who uses the water not for the benefit of the garden itself. The product is endowed to Imam Ali Mosque in Najaf. 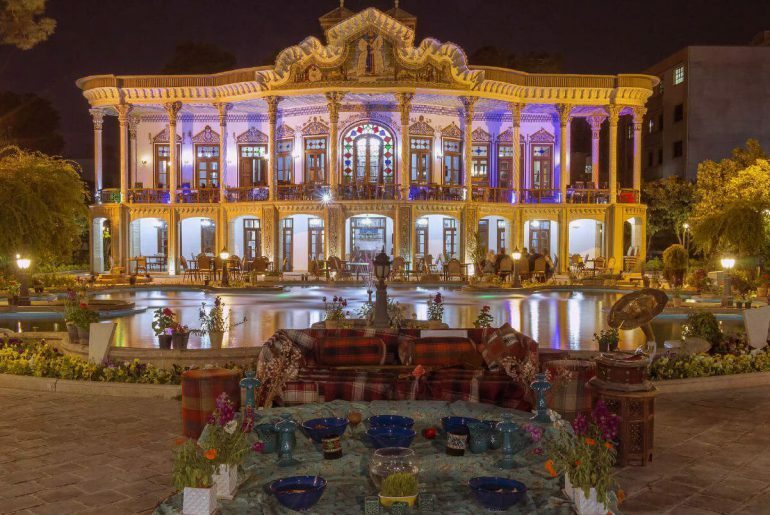 This garden had long been the residence of Karim Khan Zand, and for some time in the Qajar period, Abdul Razakhan Yazdi, who was fighting with the Qajar princes used this place as his own. 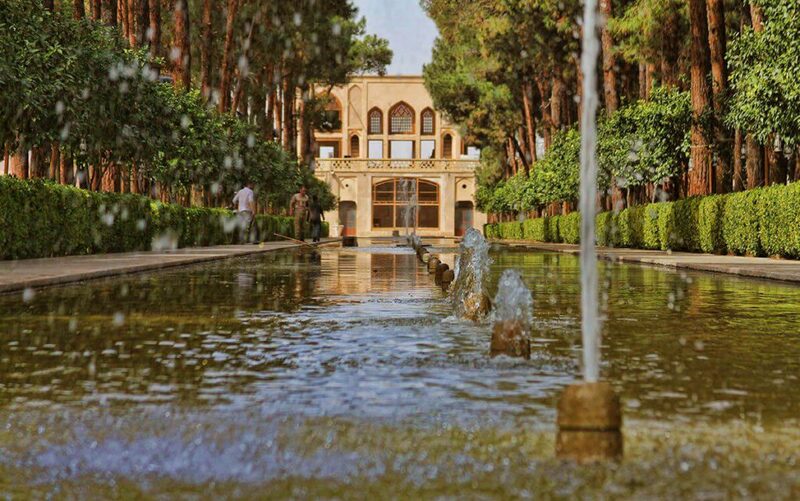 After the Qajar dynasty, the garden was abandoned for a while until from the year 1970 to 1986 where the Ministry of Culture of Iran rented it from the Department of Endowment and transferred it to the Ancient Heritage Office of the State at the time. 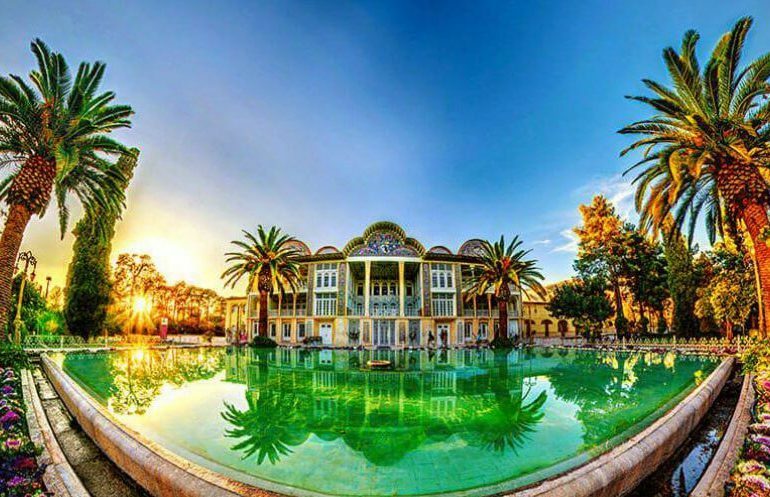 In 1970, the reconstruction of the garden was started, and parts of the complex consisted of the mirror hall mansion, staff’s mansion, the kitchens, Tehran mansion, the secluded section, water storage, the wind farm, and Cedar mansion and Paradise manor were restored. Once again, during the years 1977 to 1983, gardening and landscaping operations took place in this historic garden, but these efforts have never managed to return it to its original state at the time of Mohammad Taqi Khan. 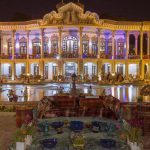 Nowadays the garden is considered as a valuable heritage from Afsharid and Zand periods and is viewed as a spectacular attraction. The design of the garden is one of the most original and most innovative woks in Iran. This garden includes four main buildings, three of which are vestibules, a hall and a hallway, they still exist along with part of the winter chambers, but the rest of the buildings and even their enclosures are gone and only 40,000 square meters of the entire garden remains. The garden surface consists of two rectangular sections, one of which is 116 by 274 meters, and another 104 by 278 meters and they are perpendicular to each other. These two rectangles form two different sections of the Dolat-Abad garden, in other words, the interior and exterior of the garden, which we will discuss in the following. Marble stones are the most important materials used in it. These rocks were brought here from Maragheh, which is very controversial because Yazd marble has always been famous for its quality and specialty, but it has not been used in this particular garden. The larger rectangle is known as the garden itself, and in the whole collection it plays the role of the ornamental gardens that were basically used as a private garden and family home in the past. In this section we are faced with a passage or axis, which in fact is an internal line of symmetry, and various elements, such as beautiful trees, which are repeated on both sides. One passes through to the mansion and the other heads to the vestibules. The pool was built between the passages (according to the main axis) and is 194 by 12 meters. With this clever design, the water is exactly in the middle of the interior space and divides the garden into two symmetrical rectangular groves. This plotting is very unique and accurate, and it can be seen in accordance with architectural proportions. If we look at this with a keen eye we can see that this axis is drawn along the northwest – southwest and is 30 degrees proportional to the Western – Eastern axis. The most important structure in the Dolat-Abad garden is this one, located at the end of the main garden and connected to the southern wall. 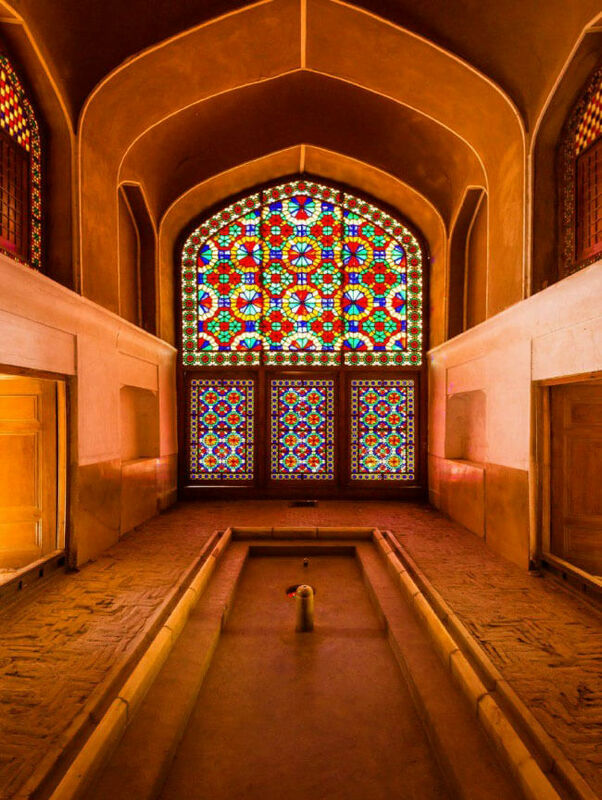 This vestibule is practically the main building of the Dolat-Abad garden, and combines the flow of air and water into the most beautiful shape. In this building wind and water are integrated into the pools and transfer the cool air from under the wind tower to the halls and rooms. Due to this kind of air cooling system, this building is known as the summer building. The vestibule is a two-story building with a shape similar to an octagon. 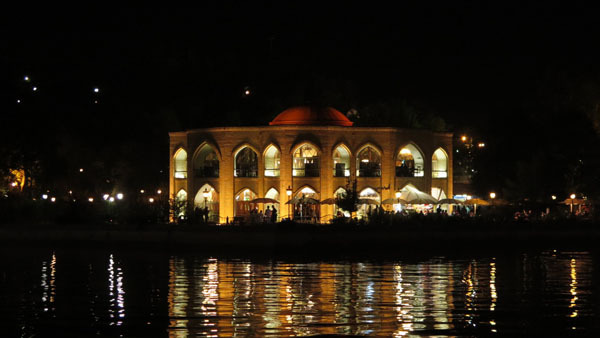 The gardens are located in a mosque-shaped dock with a rectangular door, a chamber, a vestibule, and two adjacent rooms. If you look at the ceiling, you can see a piece of artwork done in the most beautiful way possible, which is the work of Professor Haji Ali Akbar Akhund. The beauty of this floral pattern is its elaborate style. 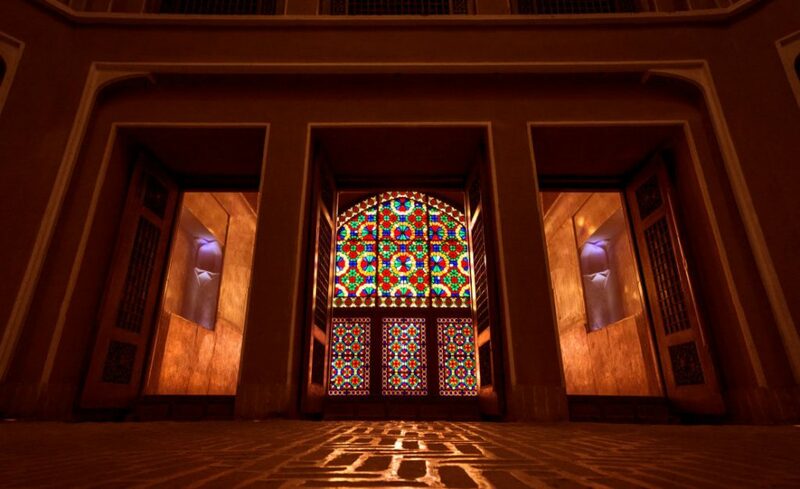 These kind of styles are commonly used in the local architecture, and are seen in numerous buildings in the city. The Sim-Gol is a mantle of sand, clay, crushed straw and a little bit of plaster, which is used for final finishes on surfaces. The Gypsum plaster, as its name suggests, works on the tails or edges, and is used for the final part of the decoration. In addition to the decorations and delicacies, the use of curtains, colored glasses adds more beauty to this mansion. There is also a hall and porch on the upper floor of the mansion, which allows you to watch the beautiful garden. 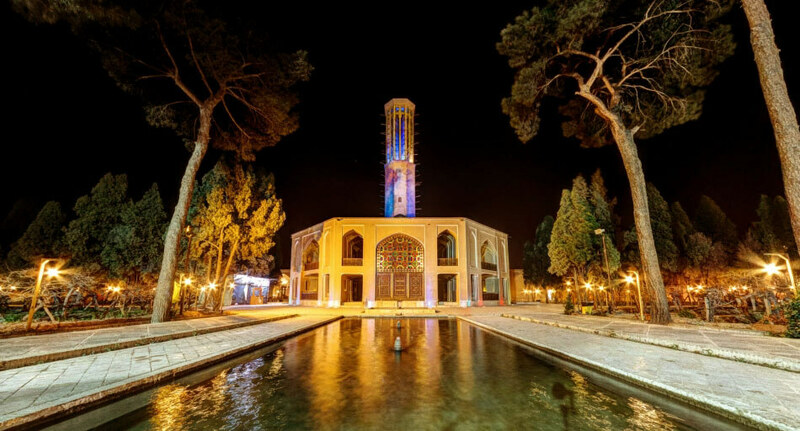 The wind tower is on the vestibule and is considered to be the most significant symbol of Dolat-Abad garden. The tower has a height of 33.8 meters and it is the tallest one in the world. The tower is octagonal and restressed and has a pond beneath it. This structure makes it possible for the tower to easily and quickly guide the wind to the bottom when it is blowing in any direction. The wind reaches the surface of the pool and cools the air from the stream. This blend of wind and cool water underneath the windpipe reaches other sections of the building, and keeps the cool breeze inside the complex. On the western side of the vestibule, a large and magnificent building called Tanabi is located, with a square wind tower just above it. On both sides of the hangar, halls, bars and nurseries are located in one floor, which runs through the gates and openings. Below this hall, there is a deep underground structure, which leads to the garden through two steps, and reaches the south by a corridor to the courtyard below. The winter residence is in the Dolat-Abad garden and has been erected south of the gardens. This building is located right in front of the vestibule and is the border between the interior and the exterior. One side on the inside and one on the other side of the complex. A strip between the two buildings of the vestibule and this residence (also known as the mansion), formed along the center of the garden. In this parts of the garden some clovers have been planted and on both sides of this are a range of cherry and pomegranate trees. Except for the aforementioned sections, there are other spaces such as the harem, kitchen, staff chambers, summer and winter stables, a carriage house, a watchtower and private water storage. The smaller rectangular area is located on the north side and forms the outer parts of the garden known as Jolo Khan. This garden is known as Beheshte Aiin, and it was once a place for the establishment of caravans, holding state ceremonies and sports events. This section is made in such a way that its axis of symmetry is perpendicular to the main axis of the garden and a large rectangular pillar is also perpendicular to it. This pond divides the structure into two square sections that make up the gardens. The mansion itself, which is located on the common border of two outer and inner gardens and has two floors. On the ground floor of the building, there is a room, a vestibule and a large room (facing east) and a few small rooms (facing the north and south) and a few corridors. Except for the mansion, the mirror hall, Tehran mansion, the two markets, two watchtowers, water storage and other houses make up the garden. 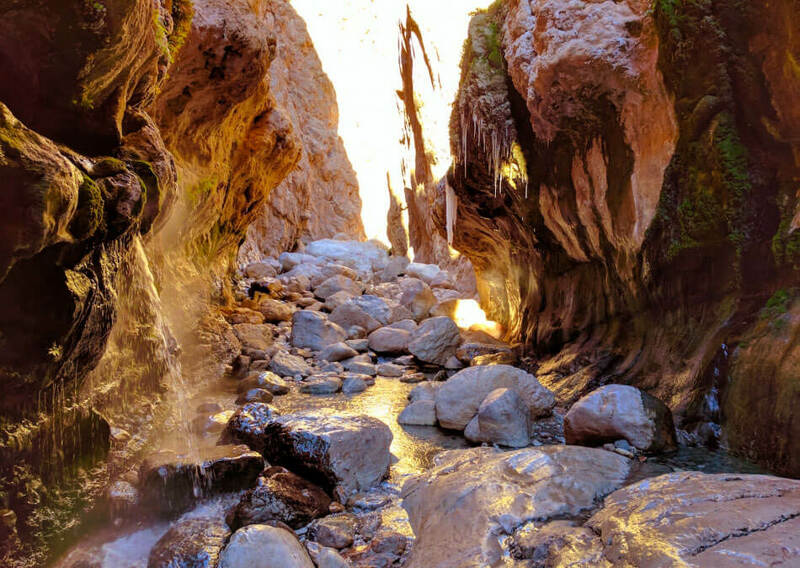 Water was the most important element for the construction of such a garden, and for this reason, at the beginning of the work and before the construction of the building, the great Khan built a 65-km-long aqueduct to transfer water from Mehriz to Yazd and the current location of the garden. 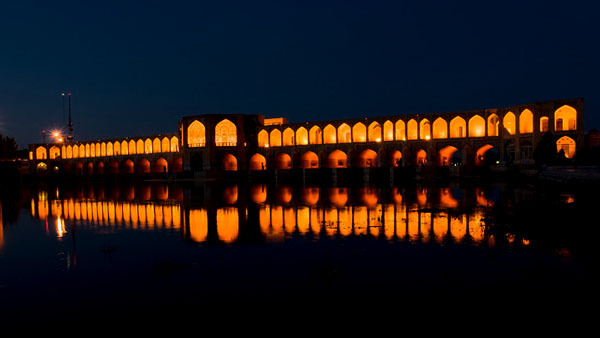 The historical aqueduct is one of the most important and longest aqueducts in the city of Yazd, which has five disciplines and originates from Mehriz highlands. After digging the aqueduct and bringing water to the garden, a form of government or a domicile was established there. Buildings, ponds, waterfalls, pomegranate and grape trees and etc. One by one, they were added to the space to create one of the most eye-catching works in an area of ​​70,000 square meters. Of course in 1992, with the construction of a large street in the north of the garden, a large part of it was destroyed in order to build the boulevard. The aqueduct is the main source of water supply for the garden, which played a major role in its green and refreshing display. 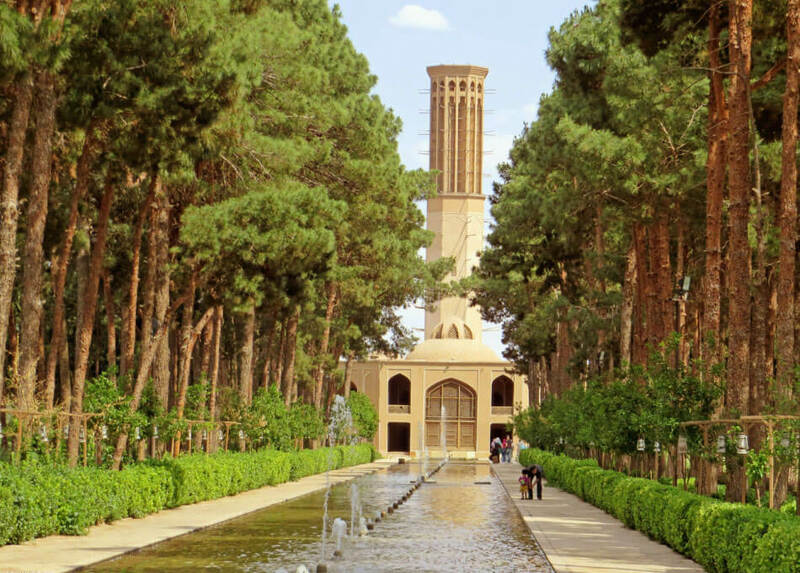 During droughts they watered the Dolat-Abad garden and filled its numerous ponds using a well that was embedded in the eastern side of the garden and alongside the service building. Along with these resources, a water reservoir was also used to store water and use it in an emergency in the Dolat-Abad garden. The water flow of this aqueduct went to the Dolat-Abad garden after watering part of the Mehriz land and deploying several water mills. It watered the trees and then continued on its way to water the agricultural lands around the garden. Today there is no sign of water in these aqueducts, and the water needed for the garden is only provided by a series of semi-deep wells. 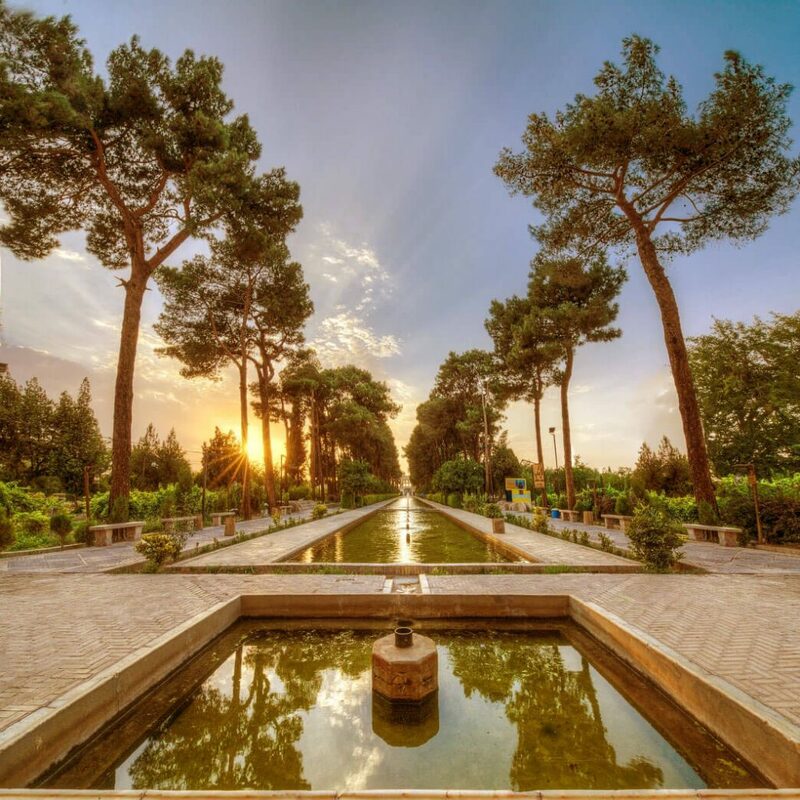 Water in this garden is displayed more than any other Iranian garden and it is used at all levels. In Dolat-Abad garden, we see the water drowning and its re-eruption in different parts, which is possible using architectural constructions. Under the wind tower of the vestibule, the first signs of water can be seen in a marble pond. Then, it goes through to the pool, and it reaches the mansion, and then proceeds to three rectangular ponds in the mansions. The water reaches the outer edge of the rooms to continue its path. Sine-Kabki is one of the most ingenious techniques of Iranian architecture in gardens and it is referred to the use of lacquered rocks in the construction of the water way to reveal the wave of the water that passes through. In this particular garden the blocks are made of marble and are carved to create a wave and show the volume of water more than it actually is. Water from the blocks is taken to a small dock called the Kalagi pond, and from there it leads itself into the gardens to create a magnificent show. The important thing about this waterfront is that it is exactly on the main axis of the garden and its dimensions are proportional to the height of the vestibules. This placement makes the image of this mansion fully reflective of the water and add to the beauty of it. In the past, after watering down, the water was thrown into a gutter, which, unfortunately, is not seen today. After the water passes through, it goes towards the hallway and enters Beheshte Aiin, to a large 12-hectare pool in the north of the mansion. After this large pool, water flows into three rectangular pools in three other directions, and then goes to the streets and villages to meet the agricultural needs. This water show represents only the creativity of the architect’s mind. The builder has not succumbed to the flow of water in the underground layers and watering the trees, and has created a master piece. The exterior garden serves as a venue for government ceremonies, sports events and city affairs. The interior gardens are private & residential. In these types of gardens, the interior section was built entirely different from the other parts, and it even had a guard on duty. 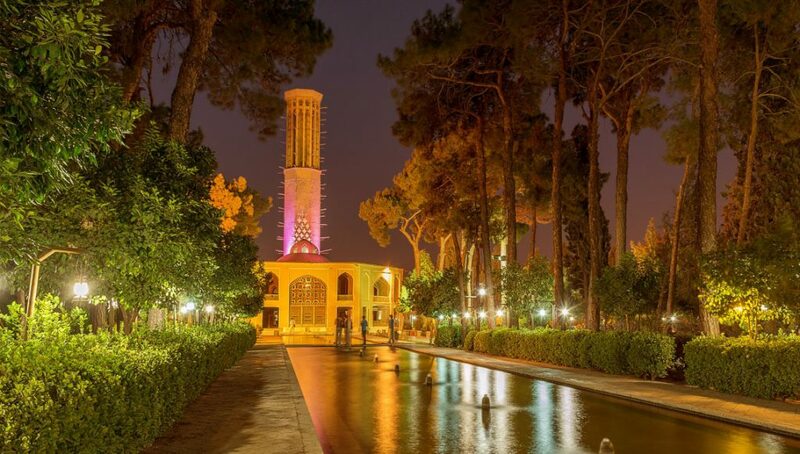 In terms of structure, Dolat-Abad garden can be considered a garden-yard, much like Qavam House and Haft Tanan Museum in Shiraz because the garden space is in the middle and the buildings and structures surround it. A masterpiece of human genius and creativity. The exchange of human values ​​over a period of time and in a cultural region that is in the field of advancement in architecture or technology, urban planning, or landscape design. The structure is unmatched or at least an exceptional one that confirms the existence of a cultural tradition or living or lost civilization. An outstanding example of architecture or technology is an important stage in human history. It directly relates to one or more issues of great global importance in these areas: events, traditions, thoughts and ideas, artwork, literary works. The plants in Iranian gardens were generally used for three goals: creating shadows, harvesting and decorations. Shaded and productive trees formed a large part of the garden, flowers and ornamental plants were less contributing. This particular garden is no exception. As we said before, the garden has two sections, including a private part and one for ceremonies and sports. On the strip between the two buildings of the garden and in the center of the central axis, we have the clovers, and on both sides of the bar we see cherry and pomegranate trees. There are several other trees in the Dolat-Abad garden, most of which are cedar and pine. Grape tree is also planted inside the plots. Rose bushes are another part of it in abundance. 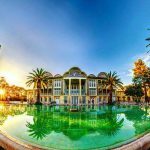 In 1970, the reconstruction of the garden was started, and parts of the complex consisted of the mirror hall mansion, staff’s mansion, the kitchens, Tehran mansion, the secluded section, water storage, the wind farm, and Cedar mansion and Paradise manor was restored. Once again, during the years 1977 to 1983, gardening and landscaping operations took place in this historic garden, but these efforts have never managed to return it to its original state at the time of Mohammad Taqi Khan. 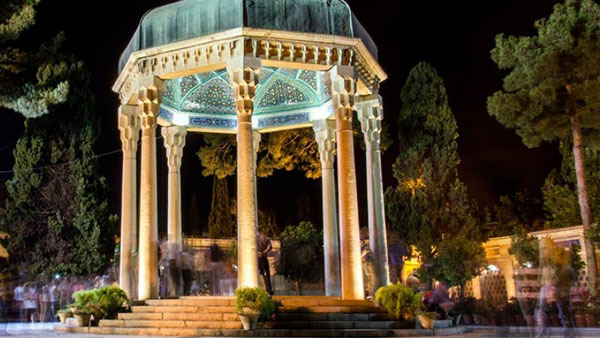 Nowadays the garden is considered as a valuable heritage from Afsharid and Zand periods and is viewed as a spectacular attraction. 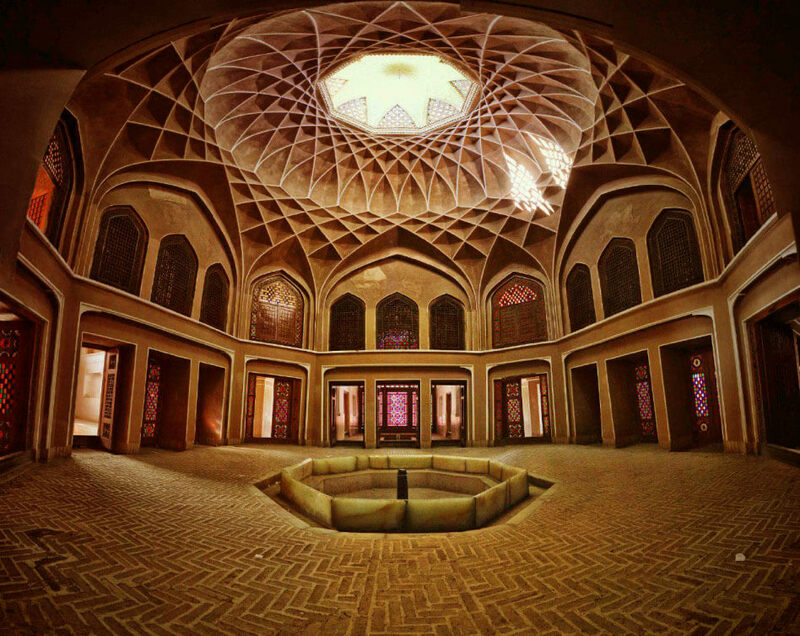 The design of the garden is one of the most original and most innovative works in Iran. Dolat-Abad garden includes four main buildings, three of which are vestibules, a hall and a hallway, they still exist along with part of the winter chambers, but the rest of the buildings and even their enclosures are gone and only 40,000 square meters of the entire garden remains. The garden surface consists of two rectangular sections, one of which is 116 by 274 meters, and another 104 by 278 meters and they are perpendicular to each other. These two rectangles form two different sections of the garden, in other words, the interior and exterior of the garden, which we will discuss in the following. Marble stones are the most important materials used in them. These rocks were brought here from Maragheh, which is very controversial because Yazd marble has always been famous for its quality and specialty, but it has not been used in this particular garden. The wind tower is on the vestibule and is considered to be the most significant symbol of this garden. The tower has a height of 33.8 meters and it is the tallest one in the world. The tower is octagonal and restressed and has a pond beneath it. This structure makes it possible for the tower to easily and quickly guide the wind to the bottom when it is blowing in any direction. The wind reaches the surface of the pool and cools the air from the stream. This blend of wind and cool water underneath the windpipe reaches other sections of the building and keeps the cool breeze inside the complex. Except for the aforementioned sections, there are other spaces such as the harem, kitchen, staff chambers, summer and winter stables, a carriage house, a watchtower, and private water storage. 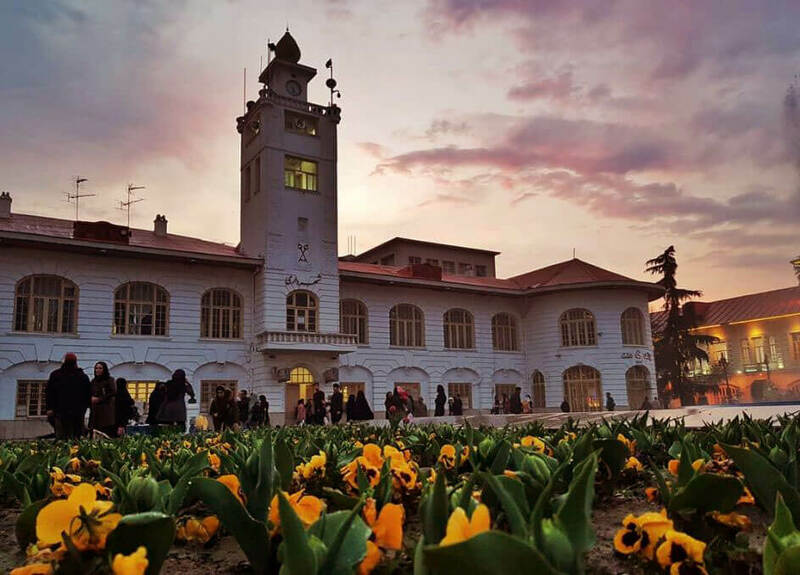 Except for the mansion, the mirror hall, Tehran mansion, the two markets, two watchtowers, water storage, and other houses make up the garden. Water was the most important element for the construction of such a garden, and for this reason, at the beginning of the work and before the construction of the building, the great Khan built a 65-km-long aqueduct to transfer water from Mehriz to Yazd and the current location of the garden. 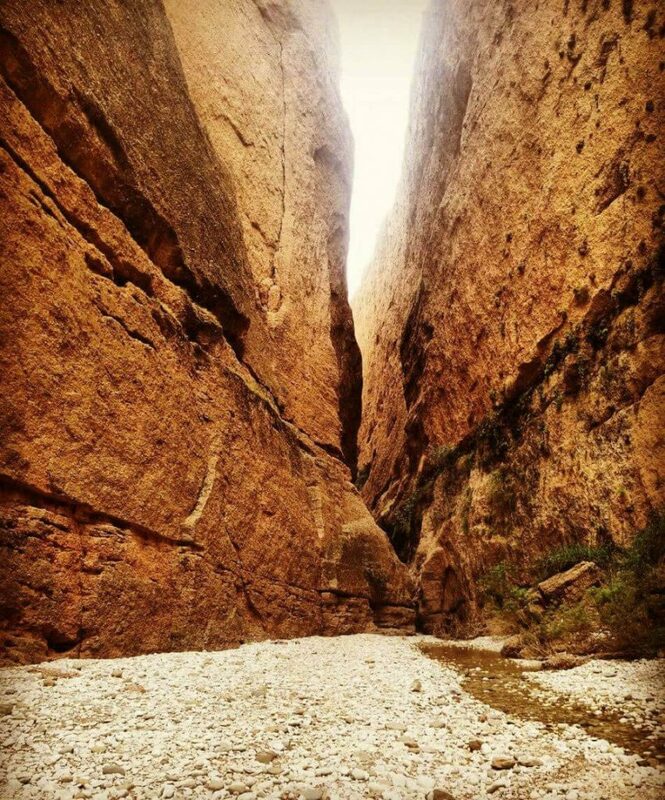 The historical aqueduct is one of the most important and longest aqueducts in the city of Yazd, which has five disciplines and originates from Mehriz highlands. After digging the aqueduct and bringing water to the garden, a form of government or a domicile was established there. Buildings, ponds, waterfalls, pomegranate and grape trees and etc. One by one, they were added to the space to create one of the most eye-catching works in an area of 70,000 square meters. Of course in 1992, with the construction of a large street in the north of the garden, a large part of it was destroyed in order to build the boulevard. The aqueduct is the main source of water supply for the garden, which played a major role in its green and refreshing display. During droughts, they watered the garden and filled its numerous ponds using a well that was embedded in the eastern side of the garden and alongside the service building. Along with these resources, a water reservoir was also used to store water and use it in an emergency in the garden. The water flow of this aqueduct went to the garden after watering part of the Mehriz land and deploying several water mills. It watered the trees and then continued on its way to water the agricultural lands around the garden. Today there is no sign of water in these aqueducts, and the water needed for the garden is only provided by a series of semi-deep wells. 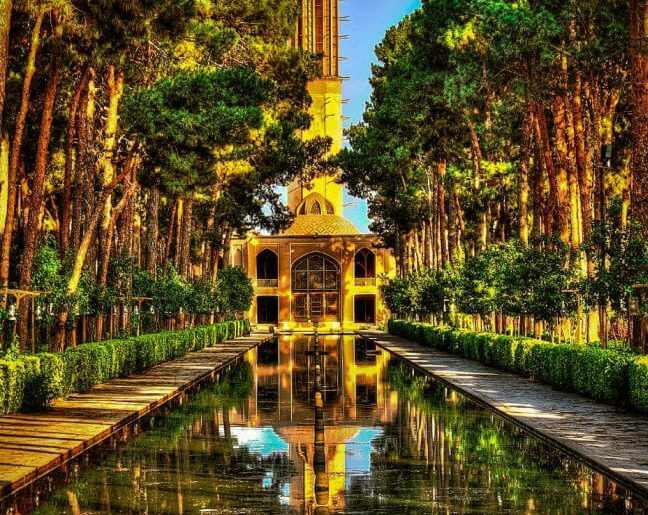 Water in this garden is displayed more than any other Iranian garden and it is used at all levels. In this garden, we see the water drowning and its re-eruption in different parts, which is possible using architectural constructions. Under the wind tower of the vestibule, the first signs of water can be seen in a marble pond. Then, it goes through to the pool, and it reaches the mansion and then proceeds to three rectangular ponds in the mansions. The water reaches the outer edge of the rooms to continue its path. Sine-Kabki is one of the most ingenious techniques of Iranian architecture in gardens and it is referred to the use of lacquered rocks in the construction of the waterway to reveal the wave of the water that passes through. In this particular garden, the blocks are made of marble and are carved to create a wave and show the volume of water more than it actually is. Water from the blocks is taken to a small dock called the Kalagi pond, and from there it leads itself into the gardens to create a magnificent show. The important thing about this waterfront is that it is exactly on the main axis of the garden and its dimensions are proportional to the height of the vestibules. This placement makes the image of this mansion fully reflective of the water and adds to the beauty of it. In the past, after watering down, the water was thrown into a gutter, which, unfortunately, is not seen today. After the water passes through, it goes towards the hallway and enters Beheshte Aiin, to a large 12-hectare pool in the north of the mansion. After this large pool, water flows into three rectangular pools in three other directions and then goes to the streets and villages to meet the agricultural needs. This water show represents only the creativity of the architect’s mind. The builder has not succumbed to the flow of water in the underground layers and watering the trees, and has created a masterpiece. 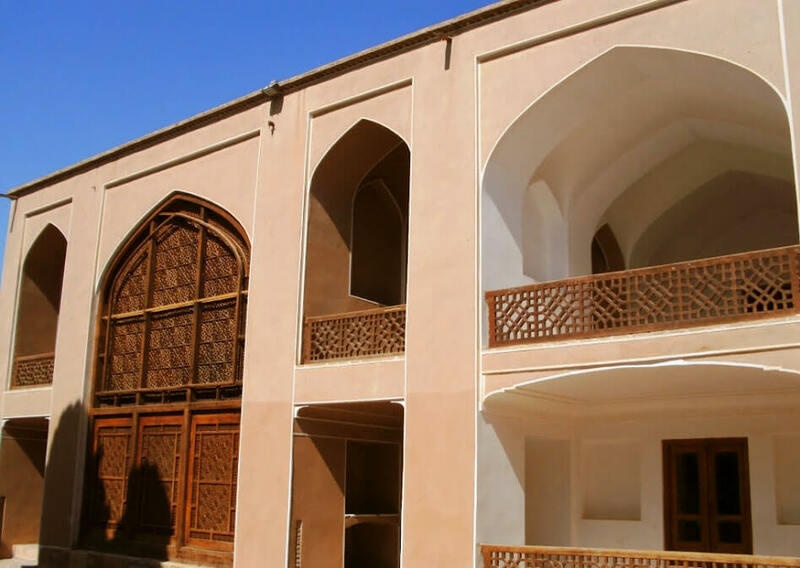 In terms of structure, Dowlat Abad can be considered a garden-yard, much like Qavam House and Haft Tanan Museum in Shiraz because the garden space is in the middle and the buildings and structures surrounding it. The exchange of human values over a period of time and in a cultural region that is in the field of advancement in architecture or technology, urban planning, or landscape design. The plants in Iranian gardens were generally used for three goals: creating shadows, harvesting, and decorations. Shaded and productive trees formed a large part of the garden, flowers and ornamental plants were less contributing. This particular garden is no exception. As we said before, the garden has two sections, including a private part and one for ceremonies and sports. On the strip between the two buildings of the garden and in the center of the central axis, we have the clovers, and on both sides of the bar, we see cherry and pomegranate trees. There are several other trees in the garden, most of which are cedar and pine. The grape tree is also planted inside the plots. Rose bushes are another part of it in abundance.